Metal Hot shoe to Tripod Adapter 1/4 inch Screw With Double Layer for Camera Tripod Head Microphone : allputer.com - Accessories for all your Portable Electronics & Computers! Here is one of the easiest way to make use of your camera's cold shoe to make you another 1/4" screw for expansion. This solid aluminum, cold shoe extension adapter allow you to attach lights, microphones, monitors or any other camera accessory to your camera with ease. 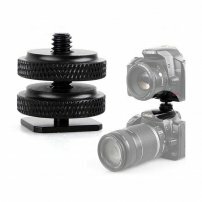 This extension adapter allows you to attach all the accessories you need by converting the cold shoe slot to a 1/4" screw, with this screw, you even can have another SLR camer on top of the camera! No joking, many bloggers need such an extension adapter for easy comparison. - This is not an electronic parts, it is just a hard ware.